Phoenix R200 is an advanced, new type of dehumidifiers with LGR (Low Grain Refrigerant) technology. Generally speaking dehumidifiers with LGR technology are 20-30% more efficient than conventional dehumidifiers although they use less energy. 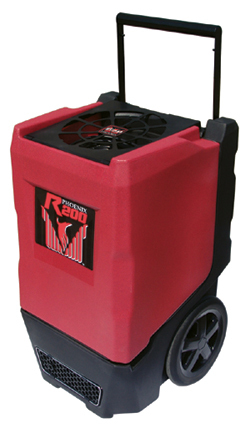 The R200 is an advanced LGR dehumidifier with many technical finesses and great features. You should seriously consider making your next dehumidifier purchase one with LGR technology. Drying technology has progressed and a Phoenix R200 dehumidifi er offers you greater drying ability than previous designs. The Phoenix R200 is a significant leap forward in dehumidifier design. Removes more than 52 litre per day at AHAM (26,7°C/60% RH). • The driest air from an LGR fi nishes jobs quicker. • Draws only 3,7 amps (851 Watt) and removes 2,7 ltr./kw. • Solid state digital controls. and perfect static pressure for hose. • Recessed 30 cm soft, semi-pneumatic wheels for easy transportation. • Stacks easily reducing storage space. with your own company label. helps remove bound moisture from structural materials. As an added bonus, the air-to-air heat exchanger does not use any so that amp draw stays low.